Our Canadian Bacon is smoked with real hickory chips for a truly authentic flavor. 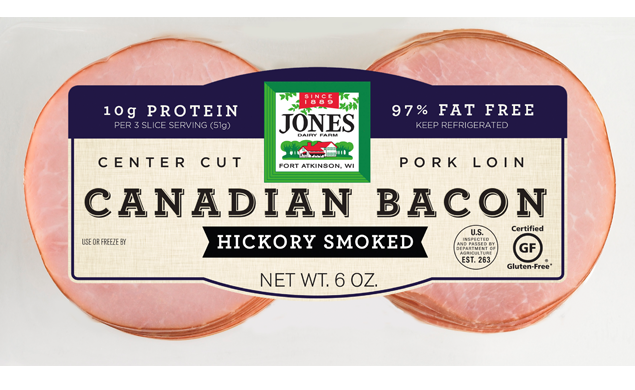 Made with only the center cut from a pork loin, our Certified Gluten-Free Canadian Bacon slices are a great source of lean protein—with an impressive 1​0g per serving. A three-slice serving also contains just 60 calories and is 97% fat free. ​It's so flavorful that ​you'll eat it straight out of the package. Cover Canadian bacon slices tightly after opening. Use within 7 days. If freezing, keep frozen for no more than 3 months. Thaw under refrigeration. Preheat griddle to 325°F. Cook Canadian bacon slices for 1 minute, turning slices at least once while cooking.